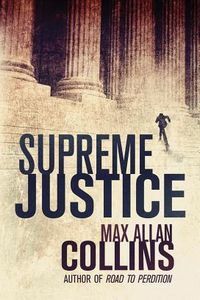 Supreme Justice by Max Allan Collins: Synopsis and Online Purchase Options. Synopsis (from the publisher): After taking a bullet for his commander-in-chief, Secret Service agent Joseph Reeder is a hero. But his outspoken criticism of the president he saved — who had stacked the Supreme Court with hard-right justices to overturn Roe v. Wade, amp up the Patriot Act, and shred the First Amendment — put Reeder at odds with the Service's apolitical nature, making him an outcast. FBI agent Patti Rogers finds herself paired with the unpopular former agent on a task force investigating the killing of Supreme Court Justice Henry Venter. Reeder — nicknamed "Peep" for his unparalleled skills at reading body language — makes a startling discovery while reviewing a security tape: the shooting was premeditated, not a botched robbery. Even more chilling, the controversial Venter may not be the only justice targeted for death. Is a mastermind mounting an unprecedented judicial coup aimed at replacing ultra-conservative justices with a new liberal majority? To crack the conspiracy and save the lives of not just the justices but also Reeder's own family, rising star Rogers and legendary investigator Reeder must push their skills — and themselves — to the limit.